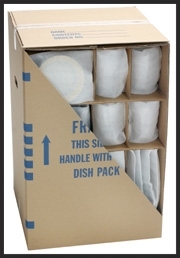 Aaron's Reliable keeps a large inventory of packing and moving supplies for sale at all times. Below you can browse our product selection. If you are interested in having any of these materials sent directly to your home or work address, simply call us at 312-491-9322 to place your order. 16-3/8" x 12-5/8" Purpose - Books, canned goods, small heavy items. G18" x 18" x 16" Purpose - Universal size, small apliances, toys, medium weight items. 22" x 22" x 21-1/2" Purpose - Bedding, towels, linens, pillows, large bulky, light weight items. 18" x 18" x 27" Double wall. Use in conjuction with the cell kit. Use for dishes, glassware, etc. Pack heavy and move with dolly. 24" x 19-3/4" x 45" Same as 20" but can accommodate an additional 4" of space. Use for mirrors, pictures, painting and posters. All mirror boxes can be telescoped together to expand the size. 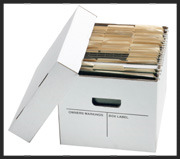 15" x 12" x 10" legal/letter size files. Requires no tape, with hand holes for easy use. Popular size box for your storage or garage. 25 lb. bundle or 1.00 per 1 lb.